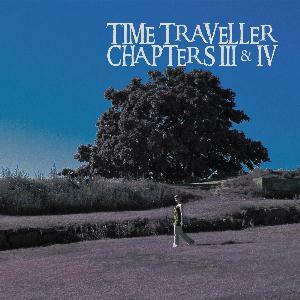 TIME TRAVELLER is, in practice, the Finnish multi-instrumental talent Juhani Nisula, who has individually done everything from composing, arranging and recording to performing the music, with the exception of drums (which are played by Zeko Takamäki) and few guest appearances. It's clearly the guitar that takes the lead role in this instrumental power rock. The half-minute opener 'Entrance' just allows to take a deep breath before 'Reality Strikes' hard with howling guitars and a massive, funky rock sound. 'The Black Hole' is an interlude-like short piece with a threatening beat. 'Inner Peace' starts in more laid-back mood - the synths are delicious - but pretty soon adrenalin flows again. Petteri Hietamäki's tenor sax solo almost has some difficulties to fit in as the goddamn guitar hero returns boasting. Despite some spacier moments Chapter III is one hell of a ride that makes your head spin. Too much on my plate. 'Code 6360025' is heavy fusion; I like the fusion spirit but not the heaviness. 'Space Harvest' is the coolest track, perhaps the cheesiest too, sort of "Power New Age" finished with 80's-like sleekiness. Anyway it's the easiest one for me to like. The heavy guitar heroism of 'Katos' just makes me feel tired of the whole album by now. In the long final track there's luckily somewhat spacier sound, and that space is naturally well filled with meaty performances especially for keyboards and guitars. No doubt this skillfully produced album has good chances of being mindblowing for friends of guitar-heavy power rock, but it's not very much up to my taste. It makes me remember the wise saying that sometimes less is more. So forgive me the low rating based on my subjective reception.